LIMITED BOOKING, so please BOOK TIMEOUSLY, to avoid disappointment! House or Hotel Room throughout Cape Town and the surrounding areas. ALL TOURIST NATIONAL AND INTERNATIONAL WELCOME! EU Certificates) and offer a wide range of massage styles. More than 10 years experience, which makes ALL the difference! We treat both Men and Women at their hotel, guest house, office, on movie sets, wherever you wish! ALL AREAS, as far as Strand, Somerset West, Paarl, Stellenbosch and Malmesbury. One always pay more for "QUALITY, PROFESSIONAL, EXPERIENCED MASSAGE SERVICE". Microblading & Lash Extension Summer Specials! 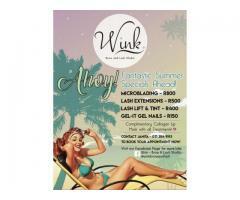 Incredible Summer Beauty Offers Available! Based in Parklands North. Enhance your natural beauty. Only top quality products, skill and care are utilized during your treatments.